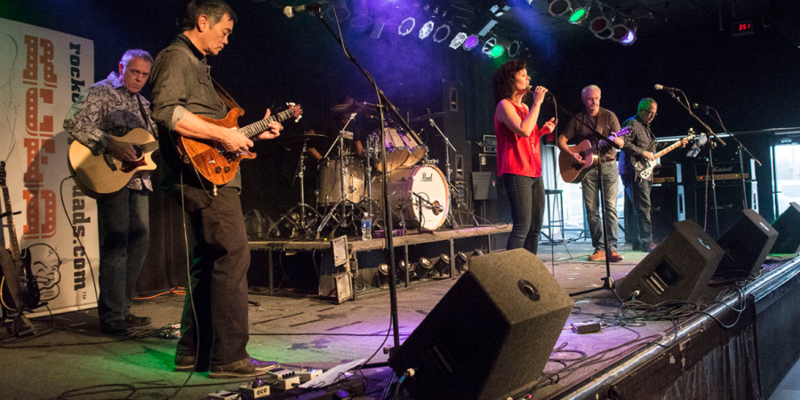 Six still standing is classic to current rock covering both men and women of rock. We're like a combination of Mellencamp and Sheryl Crowe with a little Adele and The Band thrown in. This does eliminate a few genres. We can try anything, but a lot of our music has some acoustic and short riffs with an emphasis on solid vocals. Steve is a life long fan of all music but most passionate about rock. His acoustic guitar was an ice breaker for the number one relationship in his life. So, he is convinced guitar players get the girls. He is seen with his PRS, Strat, Taylor acoustic, and occasional mando and banjo. He adds back – up vocals. He claims to have seen Hendrix at the Fillmore, the Beatles at Candlestick, Led Zepplin at the Guthrie, and Dylan at the Red Rocks. He credits his nephew for encouraging the move from folk to rock, his business partner, for simultaneously achieving Platinum status at Guitar Center, Rock Camp for Dads for shaking out the cobwebs, all young artists for keeping rock always evolving, and the other five still standing for a great partnership, friendship, and good times. He is keeping his day job. Barry ‘Not Barry’ Murphy is both an educator and the bands best drummer. He is also the best trumpeter we have. Barry is active in his local community and volunteers his time to those in need. Through Steve and the ABC Foundation he connected with a great group of people; who would become Six Still Standing. Previously, he played with the band Inertia, an award-winning, 80’s Reggae band . They played The Cabooze, Viking Bar, Ruperts, and various places around the 5 state area. They won a MN Black Music Award. Victoria sings lead vocals and plays keyboard and harmonica. We don’t know much about her – she’s either a mystery woman, or too busy to give us her bio. Victoria is often times quoted as saying, “I wish Mike could sing so I didn’t have to carry this entire band on my back”. Gary has been playing since his Junior High days in Chaska as the Infinite Set. He started out as a Bass Player and played in barns, street dances, bandshells and high school gym dances in the area. He had to give it up when he went to college, sold his 1968 blonde Fender Precision Bass (mistake) and bought an Alvarez 12 string. He played that 12 string for the next 30 years when he was asked by some advisor buddies to take up the Bass again in 2005. Although he remains a guitar player at heart, it helps him be a better bass player. Today he plays on a Rickenbacker 4003 and an American Fender Precision Bass (68 reissue). He can sometimes be seen filling in on his Taylor 12 string or six string….just can’t give it up. Pat is the newest member of 6SS. He plays rhythm/lead guitar and vocals. He plays in a of a few other bands . We will write more about him once we know him better and can think of nonsensical information to include in his bio. Mike plays rhythm guitar and vocals. He started his musical career years ago forming a band with Jim Cavalier. That band became the genesis of Six Still Standing. The duo of “Mike and Jimmy” didn’t last long because they only got together to drink beer and talk nonsense. With nowhere to turn, the duo thought of putting an ad in the paper to attract more band members. Again, the beer and the nonsense overcame getting anything accomplished and no ad was ever placed. However, through some type of mystery, Six Still Standing was formed. Mike continued to practice (that is debatable) and Jimmy decided that he had a higher calling and gracefully left the band. Mike stayed and now the band is known around the world – or at least in a very small circle of people in the Twin Cities.